Grade A- Golden Color/Delicate Flavor (compares to Vt. Fancy). Usually produced at the beginning of the new maple season. Pour this grade over ice cream for a maple sundae, sometimes called the Sugarmakers’ Favorite Dessert. Grade A-Amber Color with rich taste (compares well to the former Medium Amber). Usually made about mid-season and seems to be popular for all around use. A very good and popular choice for gifts. Grade A-Dark color/Robust flavor (compares well to the former Grade B). 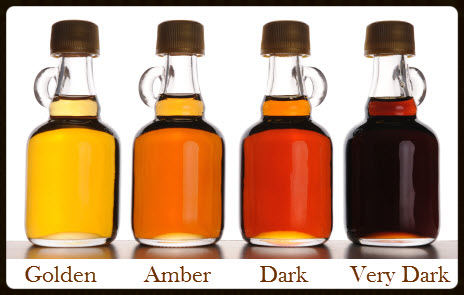 As the maple season progresses, the syrup darkens in color and develops a more robust maple flavor. This grade is great over meats, in squash and for all around use. Grade A-Very dark color/strong flavor (Even darker than Grade B). Produced at the end of the season, this grade is perfect for cooking baked beans, breads and cookies. Storage tips: Always refrigerate your syrup after opening. You can store it in your freezer to prevent crystallization. You can freeze and thaw any number of times - just thaw completely, mixing in any condensation on top before each use. This package includes one gallon of Grade A Amber Rich Maple Syrup. This package includes two half gallons of Grade A Amber Rich Maple Syrup. This package includes four quarts of Grade A Amber Rich Maple Syrup. This package includes four pints Grade A Amber Rich Maple Syrup. This package includes four half pints of Grade A Amber Rich Maple Syrup. One Pound and One Half Pound of Maple Cream. 2018 Best of Show Maple Product at the Vermont Home Show. This package includes two 16 oz jars of Maple Jelly. Maple jelly is excellent when spread over cream cheese and crackers, paired with a glass of red wine. This package includes two half gallons of Grade A Dark Robust Maple Syrup. This package includes four half pints of Grade A Dark Robust Maple Syrup. This package includes one gallon of Grade A Dark Robust Maple Syrup. The first step is to identify the Maple tree to tap. Our favorite tree is the Sugar Maple Tree. It takes 40 gallons of sap to produce one gallon of syrup. Freezing night followed by warm days causes the sap to flow. We usually will start our sugaring season in March and lasts about six weeks. 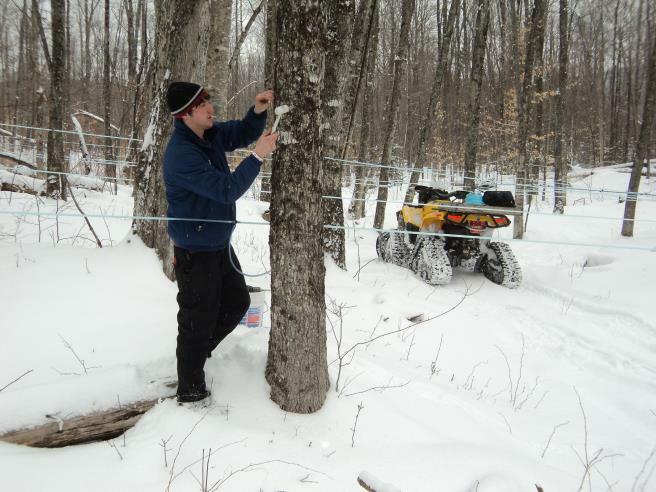 Snow on the ground insulates the trees from the cold nights and the warm days are needed to produce sap. We sometimes have to wear snowshoes in the woods if the snow is deep. Once the sugar maker is determined to start tapping, We use plastic spout (tap). We insert more taps when the trees are large in diameter. This is a spout and tubing ready to collect the sap. Tapping trees with this conservative method protects the trees from being harmed. After the season is over, the taps are removed and the tree will seal up and heal. New tap holes are drilled in the maple tree each year. We have modernized our operation to maple tubing that is strung from the maple tree to a main line. The sap drips from the tree on warm days when the conditions are right. Depending on the size of the maple tree, spouts and tubing are run from the tree to the main line to connect to the vacuum pump. The sap is collected into a large holding tank and stored until there is enough in the tank to transport to the sugar house. 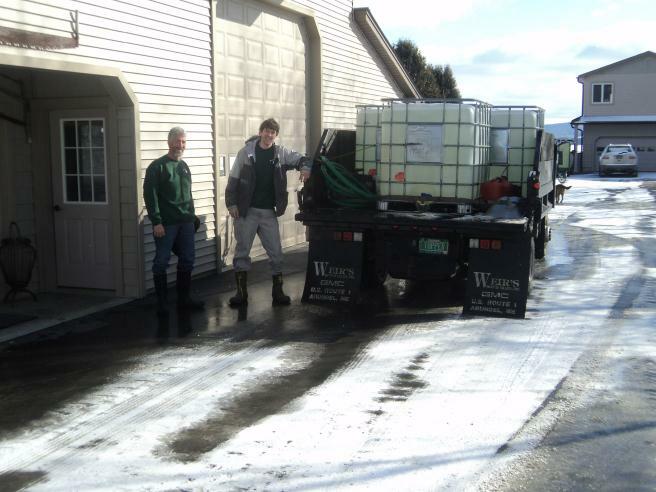 We pump the sap from the holding tanks to gathering tanks from our Morgan and Lake Road locations and then transport to our sugar house. The sap is pumped from the gathering tanks into a storage tank ready to be processed. It is then processed by the reverse osmosis and stored until it is ready to boil. The Reverse Osmosis (RO) filter pumps the sap at a very high pressure into a membrane sap filter. This removes the water from the sap which reduces the boiling time. This process does not harm the taste of syrup and less wood is needed for the evaporator. This is our evaporator where we boil the sap into syrup. Our evaporator is wood fired and looks like a maze type box which sits on top of a firebox called an Arch. The sap has to reach a point that warrants it to be deemed at the proper consistency. The automatic draw off is used to help the sugar maker make the desired quality of syrup. In 2012, we won VT Farm Show "Best in Class - Medium Amber" and "Best in Show" at the Vermont Farm Show. In 2018 "Best of Class (Maple Cream" and "Best of Show Maple Product" at the St. Albans Maple Festival. We have many ribbons and awards for our fine maple products. We were voted as Orleans County Maple Sugar Producer of the year in 2017!! This is our sugar house located on beautiful Lake Memphremagog at 362 Strawberry Acres, Newport, VT. We hope you will visit us during the annual Vermont Sugar Makers Open House in the spring of each year!